Turmeric is a wonderful little spice that you can find at almost any grocery store. Not only is it a superfood and a beauty remedy that has been used for ages, it is also the perfect all natural dye. I love yellow and turmeric gives clothing a beautiful deep yellow color once dyed. Start by soaking your shirt in cold water, which will help set the dye. Tightly wrap your rubber bands around your shirt. You can make a million different patterns which is the fun part about this. Add 3-4 tablespoons of turmeric powder (I purchased it in bulk at my local health food store) to a large pot of water. Let it simmer for about 30 minutes and then add your shirt. Let it soak in the dye for about an hour. I poked it with a wooden spoon (which is now stained bright yellow forever) every 15 minutes or so to help ensure it was setting evenly. If you want an even deeper yellow you can leave your fabric in the mixture longer. Once you are satisfied with the color, take out your shirt and rise it in cold water until the water runs clear. Remove the rubber bands and let dry. This is such a simple, green (in this case yellow hehe) way to change up a old white shirt that may need a new life! On a side note: Happy first day of spring, which is my favorite season of them all! That is so cool! I love the pretty yellow it turned into! Oh wow! It turned out great. I haven't tie-dye clothes since I was a little, brings back memories. I love this! Lindsay you're so creative, this is too cute! Does this work with other brightly colored spices? Maybe Cayenne Pepper for a red color? This is soooooo cool!Looks like something they'd sell at JCrew for like $50 buckaroos. This is so cool because I always have turmeric on hand. Gotta try this...I wish there was something to color set it because the only turmeric may fade out gradually with washes. How cool! 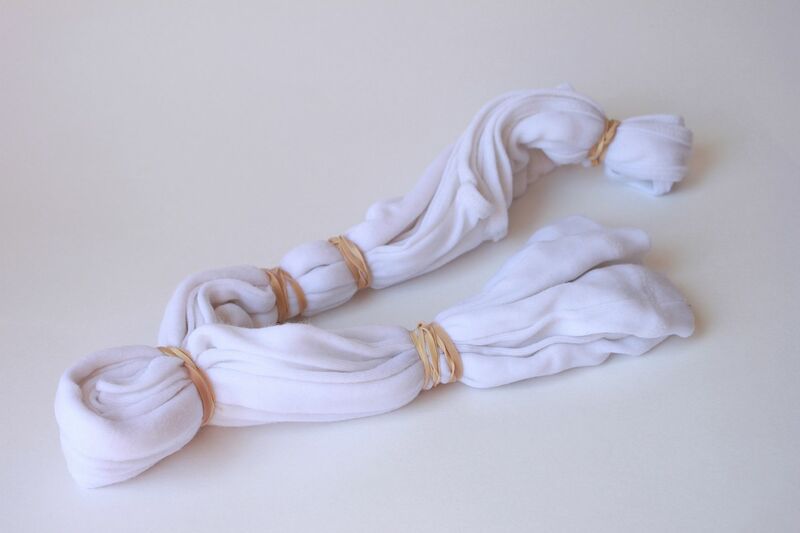 This is a great solution to those white t-shirts that have those awful yellow pit stains (we all have at least one, right??). I LOVE this idea. How perfect for spring! that is soooo cool! yellow is my favorite color and this looks super easy to do! :) oh, and is there a specific way to wash it? This is so creative and so cute!! Just found your blog via "rolled up pretty" and I am in love!!!! I'm your newest follower! that color is gorgeous! my mom's been on a huge turmeric kick lately, i'll have to tell her what else it can do! Wow, what a perfect sunny yellow color! I have similar questions as a lot of posters - how do you wash it? Will it potentially stain other clothes? Whoa, interesting! That sounds fun. I haven't made a tie-dye shirt in ages. Who knew?! 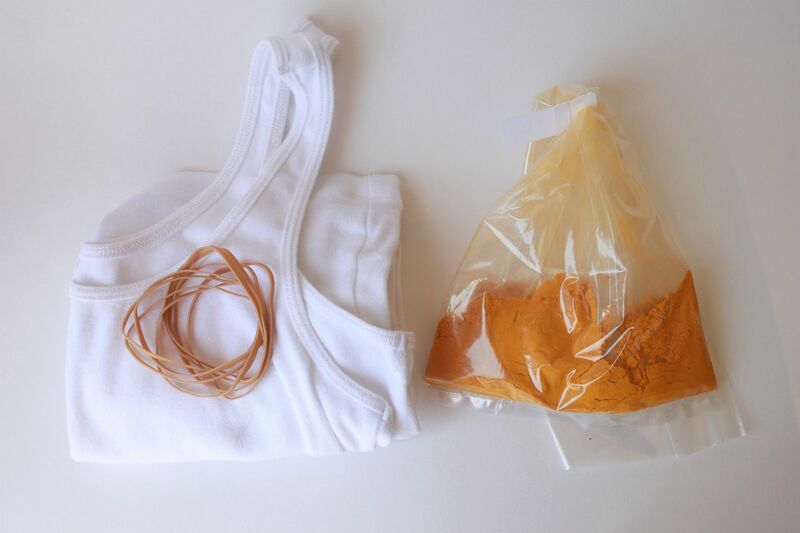 I never thought of using turmeric as a textiles dye! LOVE it! You really are so creative!! 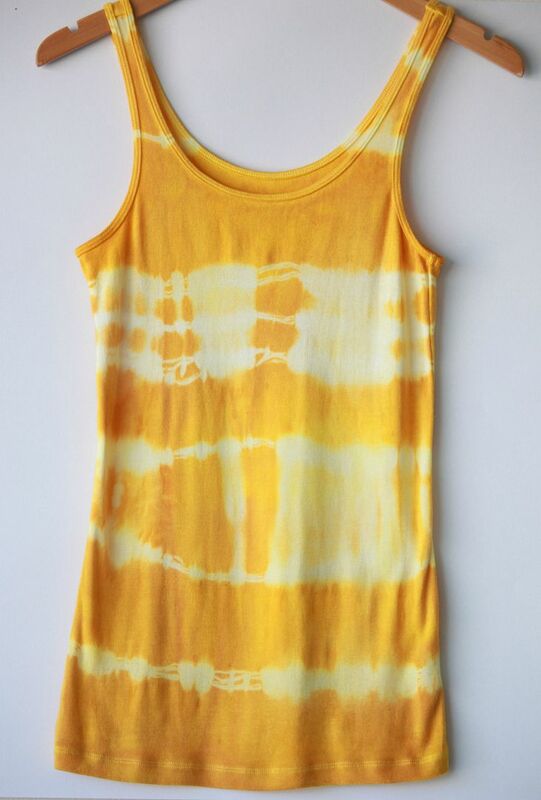 This looks awesome and so simple, I never thought of using a spice to dye a shirt before! I definitely want to try this. 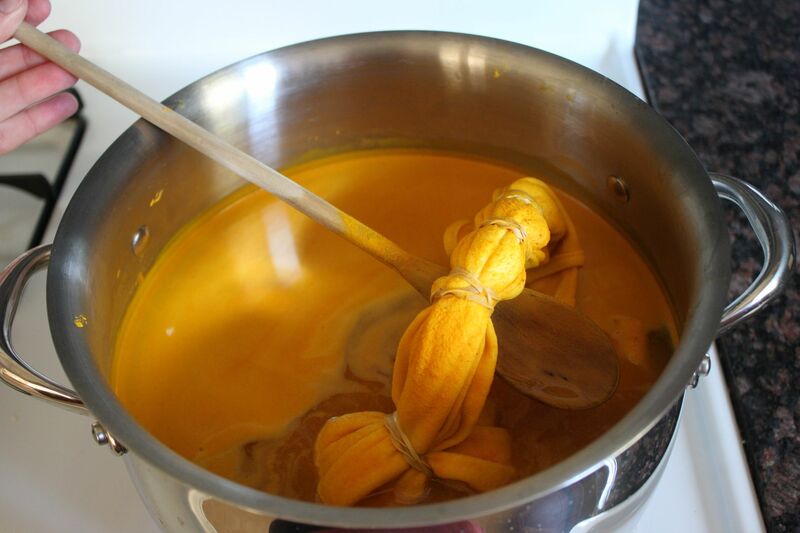 Love this color and the natural turmeric dye idea! Thanks for posting! Thank you! Saved the day making a too red mix (using boxed yellow & red dyes)into a lovely just right orange...mahalo! The last step of dyeing is usually heat-setting, so I'd say it sure wouldn't hurt to air-dry your project then finish with a long dryer session or hot iron between newsprint or old sheets. I think I will try to make a sunny tablecloth from an old cotton flat sheet I have. This is so cool! Thanks. We tried this and had great results!